1Q: Tell us a little about the origins of Miss India America, from concept to financing. 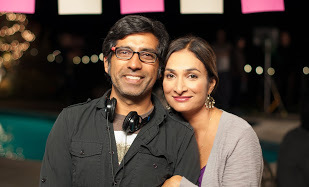 Meera was once a Miss India California and a runner up at a Miss India America pageant, and not coming in first has deeply scarred her, so writing this movie together was the only way to give her closure. Also we thought it would be a fun setting to explore the theme of winning. And so with the support of our amazing producers Megha Kadakia and Saurabh Kikani we set to work on the script. Once we had it in a good place we did a Kickstarter campaign to raise some of the funds while also approaching private equity investors. Raising the cash was both a slog and inspiring. It definitely forces you to examine and explain why you need make this story so badly. It also opens up a world where you meet some incredibly generous and genuine human animals. 2Q: Cinequest Film Festival is hosting the World Premiere of Miss India America. Explain to us how it feels to bring this film before audiences for the first time, and what do you think their reaction will be to your film? They’re gonna love it! We hope. We’ve had a few smaller private screenings and we’ve been really happy to see the audience finding the movie funny and being taken on an emotional trip at the same time, which is hugely gratifying to us. 3Q: What was your best and/or worst experience while making Miss India America? The best experience is the bonds you make with the cast, crew, investors and supporters. That’s hands down amazing. The worst experience was our kids hating us because we neglected them. They should see it to have an old school movie experience of watching a fun, smart movie where a character grows in a world that is unique and the themes are universal. 5Q: Time to pre-plan: You just won the Oscar for Miss India America. Give us your acceptance speech. We would like to thank the audience members at Cinequest for watching the film and getting the ball rolling, which has led us to be here today standing in front of Meryl and George. See MISS INDIA AMERICA at Cinequest!